Patriotic Logo USA Glow Stick. Add lanyard to create a necklace. 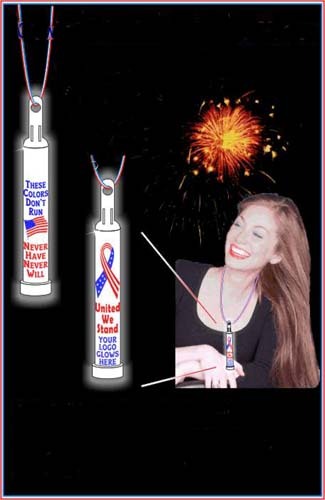 4 inch glow stick With Red and Blue imprint. Optional red-white-blue lanyard attached or bulk to form a necklace. • To activate just bend & shake...Glows bright for hours! • Two-color translucent imprint...Red and blue imprint actually glows and looks real cool!